Got Pests? We've Got Solutions! D-Tec Pest Solutions is a Proud Family Owned and Operated Pest Solution Business. The Company has won 16 National, State & Local Business Awards. We have an immediate 24 HOUR ACTION RESPONSE to live Termite issues. Call us on 1300 725 758 or to receive a free quote - click the link. Call 1300 725 258 for urgent Termite issues or click link to find out more about our Termite Solutions or book a free quote. We can take care of all pests including cockroaches, ants, silverfish, spiders, redbacks, rodents plus many more. Click to shop our online store for your household pest control solutions for both indoors and outdoors keeping your home pest free. Talk to our Pest Control Specialists today! The team at D-Tec value your loyalty and support. We have a service cashback promotion for any referrals you make to our company. For more information or to ensure you are on our mailing list for your pest inspection please add your details here. 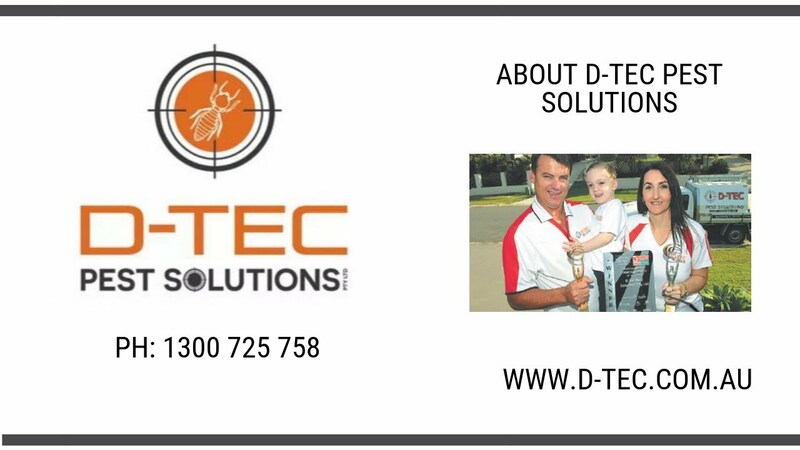 D-Tec Pest Solution helps the Community with the whole family doing many Fundraisers to help serve and support the local community. D-Tec has a Client Care program to ensure every Client receives a professional service every time. Our technical ability, experience and skills are to provide you with high quality treatments and inspections in accordance with industry best practices. D-Tec has fully licensed, qualified and insured Technicians. All Technicians are Termidor Accredited and trained in using a T3i Termite a radar, thermal & moisture radar.